President Donald Trump's actions at the recent G-7 Summit – imposing tariffs on America's trading partners a few days before the meeting opened, leaving the meeting early, refusing to sign the closing protocol, and disparaging the meeting's host, Canadian Prime Minister Justin Trudeau, in post-conference tweets – continues his policy of "America First," independent of and alienating toward our longstanding Canadian and European allies. Trump has criticized the policies of the prime minister of Great Britain and the Chancellor of Germany, questioned the need for NATO, and praised Russian president Vladimir Putin. The western alliance – the longstanding friendship among the U.S., Canada, Britain, France, Germany, and other democratic nations – seems to be fraying these days, mostly due to Trump's indifference or belligerence. Of course, Britain's exit from the European Union (which Trump praised) and other factors have played contributing roles. America has been estranged from its western allies before. When that has happened, thoughtful leaders have urged reconciliation. Paul-Henri Spaak, a former Belgian prime minister, published an influential article entitled "The West in Disarray," in the journal Foreign Affairs in 1957. Spaak was concerned that the western alliance seemed to be foundering on disagreements over a number of issues. The United States had opposed the invasion of Egypt by Israel and our European allies, Britain and France, after Egypt had nationalized the Suez Canal in 1956. The United Nations, with U.S. approval, condemned the action as aggression and sent in peacekeeping troops after the invaders, under international pressure including from the United States, agreed to withdraw. At about the same time, though, the UN took no decisive action when the Soviet Union invaded and harshly repressed a popular uprising in Hungary around the same time. "In this welter of events, resolutions and decisions, not to mention feelings, we find food for somber thought," Spaak wrote. To Spaak, three things were all too apparent from these events. The same insights might be useful to recall today. 1. The United Nations is ineffective. Spaak, a supporter of the UN at its founding in 1945, had become disillusioned. "Its ponderousness, the time it wastes, the hypocrisy which frequently marks its debates, its oft-demonstrated inefficiency" has meant that "everything short of war is allowed. Treaties may be violated, promises can be broken, a nation is licensed to menace its neighbor or to perpetrate any sort of trick on it, just as long as there is no actual war." Spaak's assessment of UN impotence has largely held up. For instance, the UN has played a minor role in the Mideast, e.g., the Syrian civil war. It was the UN that authorized resistance to the North Korean invasion of South Korea in 1950. The war was fought under UN auspices. But America provided most of the troops and war materiel. The Korean War Armistice Agreement, July 27, 1953, was signed by U.S. Army Lieutenant General William K. Harrison, Jr., but in his capacity of "Senior Delegate, United Nations Command Delegation." The UN has helped impose economic sanctions on North Korea. But in the buildup to the recent summit between President Trump and North Korea's Kim Jung Un, the UN played no apparent role. No one proposed that U.N. Secretary-General António Guterres rather that President Trump should meet with Kim Jung Un. 2. Russia is working tirelessly to disrupt the western alliance. Its goal, Spaak explained, was "to weaken the Western nations, to create difficulties for them by complicating and poisoning the problems with which they are faced, and yet to refrain from overstepping certain limits beyond which they inevitably would find themselves involved in a world war." Spaak had Soviet espionage, its Hungarian invasion, and other acts of Communist aggression in mind. Communism is gone, but today Spaak's criticism might be applied Russia's invasion of Ukraine and annexation of Crimea, its military intervention in Syria, and its meddling in the 2016 U.S. presidential election and other elections in western nations. In Spaak's view, the Soviet Union represented aggressive totalitarianism. He urged his readers to recall that this was the opposite of western values – "the moral, political, economic and social evolution of both Europe and America has proceeded and on which it today is based" – including the peaceful resolution of international disputes and respect for individual rights. 3. America and Europe need each other. "Europe can no longer do without the United States; that is a fact which calls for no further demonstration," Spaak wrote. "And the United States would be deeply mistaken to imagine that it can get along without Europe. In spite of the difficulties which sometimes make the coordination of policy difficult, in spite of the regrettable events of these last months, where are America's best friends? In Asia or Africa? No, in Europe." Spaak included advice that was aimed mostly at President Dwight Eisenhower but might also be relevant for President Trump to ponder. With America alienated from its European allies, "a more and more confused situation is developing in which the Western world risks losing much." But "so little is needed to make the Atlantic Alliance what it should be. The principal partners need only to have a little more trust in one another, to be more deeply aware of their fundamental unity." Alliances need nurturing. Otherwise, "little by little the instrumentalities lose their force and scope and hopes dissolve in disillusionment." Spaak ended with an appeal: "Where are the men of clear mind and resolute will that the West needs desperately to save its precious inheritance?" Spaak's appeal resonated. He articulated what many people in America and western Europe had long understood: the western alliance was essential. Eisenhower and his counterparts in Europe soon repaired the damage to the alliance. Spaak himself went on to serve as Secretary General of NATO, president of the UN General Assembly, and an architect of the European trade and economic cooperation. The western alliance got stronger. Hopefully that will happen this time. Prime Minister Trudeau, while vowing at a news conference after the G-7 conference that Canada will not be pushed around and promising retaliatory tariffs against the U.S., also recalled the many years of U.S.-Canadian friendship, citing fighting side-by-side with the Americans during World War II. In his official statement on the G-7 Summit, Trudeau said the summit had "focused on economic growth that benefitted everyone" and did not mention Trump's criticism. British Prime Minister Theresa May's report to Parliament acknowledged there had been "some difficult conversations and strong debate" but emphasized progress on equality, environmental issues, and even "the importance of the multilateral rules-based trading system, as the framework for enabling free and fair global trade." German Chancellor Angela Merkel called Trump's refusal to sign the agreement's protocol "sobering and somewhat depressing." 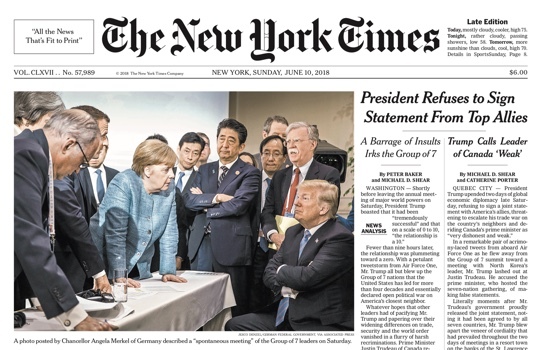 But for the most part, theEuropean and Japanese leaders who attended the meeting have, so far, tried to put the best face on the G-7 meeting and on their sometimes stressful relations with Trump. "International cooperation cannot depend on fits of anger" said French President Emmanuel Macron after the meeting. "Let us be serious and worthy of our people." That echoes Paul-Henri Spaak's call for people of "clear mind and resolute will" to correct the disarray and build on the historical strengths of the western alliance.